Real Leaders Don’t Do PowerPoint isn’t a diatribe against the most ubiquitous program in today’s business world. It’s a call to action, an appeal to leaders to speak in a way that makes them stand out from the crowd. Leaders don’t speak like everyone else. Or, at least, they shouldn’t. Leaders aren’t concerned primarily with communicating information. Leaders speak to influence the way people think and feel, and to inspire them to act. The reputations of leaders and the success of their ventures depend on how well they present their ideas. On their confidence and clarity. On their persuasiveness. On their engagement with the audience. Even if you aren’t a leader—and who’s to say you aren’t a leader?—you can learn from leaders how to present yourself and your ideas more forcefully. 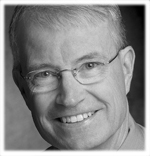 In Witt’s succinct and humorous assessment of leadership strategies and the art of the public presentation, the business consultant focuses on the basics and the particulars that often go by the wayside when speakers rely on crutches like PowerPoint. In this page I’ll share some of the main points from the book. But if you’d like to learn more, you can always buy the book in the US here or in the UK here. Audiences don’t distinguish between you and your idea. If they like you and trust you, they’re much more likely to pay attention to what you say and to give it credence. If they dislike you or, worse, if they mistrust you, good luck. Be your best self. Speak the way you naturally do, using your normal voice and gestures, sharing your hard-earned wisdom and insights. Don’t be afraid to make it personal and to tell stories and lessons you’ve learned from your own life. Thought #2: To speak like a leader, take charge of the event. To have the most impact and the best chance of giving a memorable speech, take charge of the event itself. Pay attention to the schedule and agenda. To what is happening before and after you speak. To the place where the event is being held and to the physical set-up of the room.To the audience and their needs and expectations. 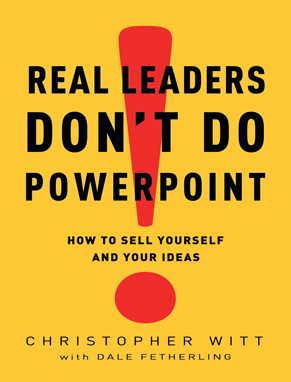 In Real Leaders Don’t Do PowerPoint, Christopher Witt offers solid advice, emphasizing the importance of having a compelling message, making the whole event memorable and ensuring that you—the messenger—are credible. Thought #3: To speak like a leader, create a compelling message. Build every speech around one and only one idea. Put your idea out there as simply and as forcefully as possible. Don’t fluff it up with big words. Don’t puff it up with extraneous thoughts. Thought #4: To speak like a leader, deliver with style. A powerful delivery can drive your message home. A weak or ineffectual delivery can drive your audience to distraction. 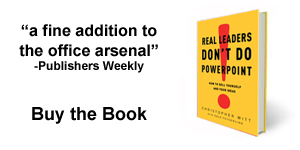 Download (for free) the table of contents and first chapter of Real Leaders Don’t Do PowerPoint here.